Ready to create your own iPhone app? 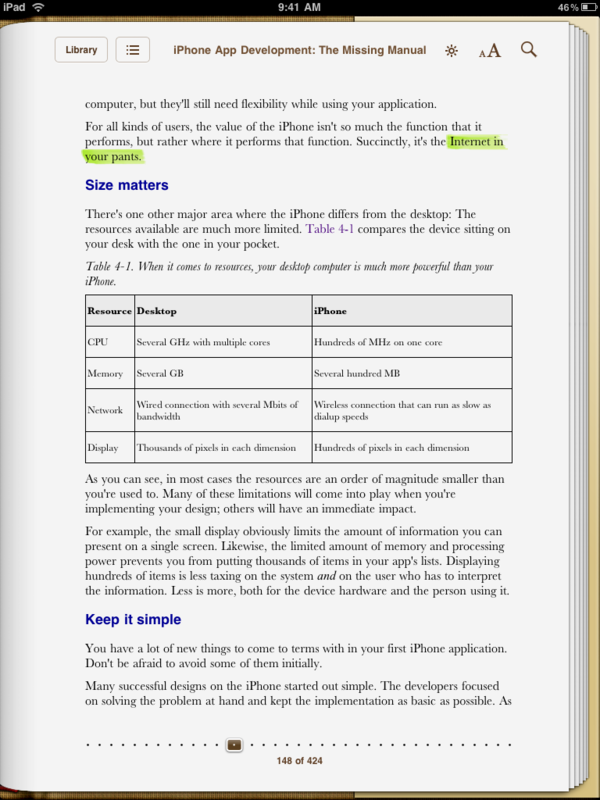 This book walks you through the entire iPhone app development process from start to finish. Wow! Response to the book has been way beyond what any of us expected. It’s currently ranked #131 among ALL books sold by Amazon. Thanks to everyone who pre-ordered, your printed book should be shipped sometime around May 14th! 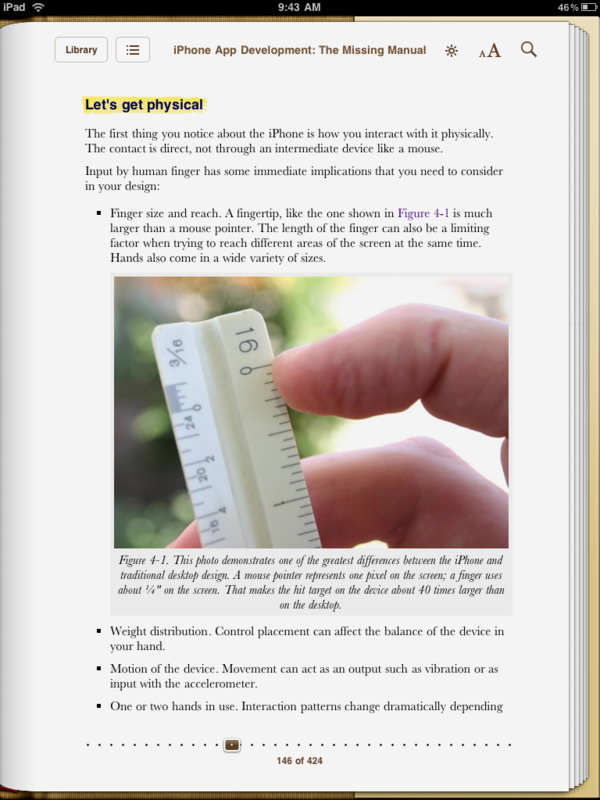 Many people have been asking about the availability of the book on the iPad. That’s not surprising: if you’re interested in the iPhone OS you’re probably like me and have a bunch of devices sitting on your desk. 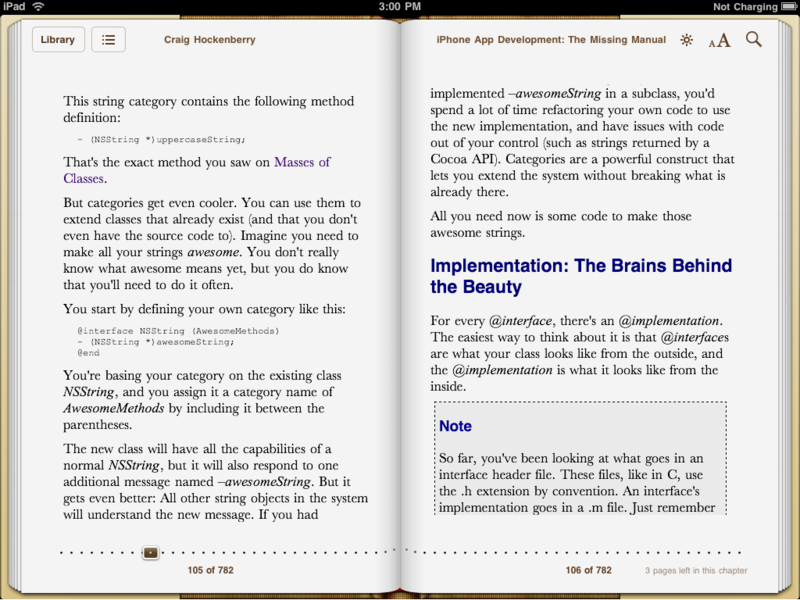 I’m happy to report that O’Reilly’s Ebook bundle includes an edition in the ePub format used by iBooks. Once you’ve purchased this book, it’s a simple matter of dragging and dropping it onto iTunes and then syncing to your iPad. You can purchase the Ebook bundle today from the O’Reilly catalog. Unfortunately, some production delays prevented those Xcode projects from appearing on the Missing CD site. Hold tight, we’re working to get them uploaded as soon as possible. Once we do, you’ll find it really nice to check out the code on your Mac with the Missing Manual by your side! Thanks again for all the support and well wishes—they’re very much appreciated! Updated May 7th, 2010: The source code and other collateral for the book are now available on the Missing CD. When I began to write this book, I made an important observation: there are many great books that cover the APIs that make up the iPhone SDK. There are books that examine important topics like interface design. 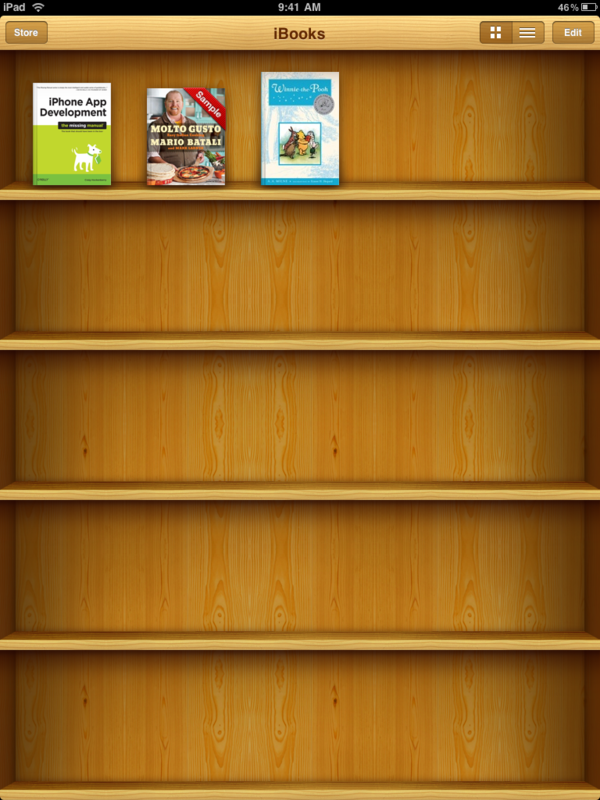 And, of course, there’s a rich library of information available on Objective-C, Cocoa and other underlying technologies. With its multi-touch display, ubiquitous networking, and small form factor, this device we carry around in our pockets is a major shift in computing. A new platform doesn’t come along very often, but with over 75 million devices sold in 2½ years, I think it’s safe to say the iPhone has arrived. And with a new platform comes a question: what does it mean to be an iPhone developer? With the arrival of of this new device, you’re not just dealing with new technologies in the iPhone SDK, you’re also struggling with new concepts and how to apply them. You can’t take all your experience with desktop computers and use it on a mobile phone. New workflows for developing code need to be adopted. Different approaches toward pricing and distribution must be examined before uploading your work to iTunes. Understanding customer behavior changes as you enter a mass market. In short, there’s more to learn than just how to code, so I wrote about it. Of course, I cover topics like Objective-C and Cocoa Touch in detail, but that’s not the overall focus. As the header on this website states: This book walks you through the entire iPhone app development process from start to finish. To get a feel for what you’ll see on this journey, take a look at what ‘s covered in each chapter. Craig Hockenberry has been working with software for over 30 years and is currently a principal at the Iconfactory. Recently his work has been focused on award-winning applications for the iPhone.